During the winter of 1960, Bill completed a set of five parade floats for Mills Bros. Circus under the name Tracy Displays, Inc., which was located in Union, New Jersey. The vehicles that he built were similar to the 4 x 8 units that he produced the previous year for the Clyde Beatty-Cole Bros. Circus. They were drawn by ponies, but were constructed without the motorized animation like the Beatty Circus floats. According to Bill Tracy, this approach made them more durable over the long run. Some of the designs depicted Hansel & Gretel, Captain Hook’s Pirate Ship, and Cinderella’s Carriage. Mills Bros. also ordered numerous clown props during this time. Article regarding Tracy’s floats for Mills Bros. Circus, as published in the January 11, 1960 issue of The Billboard. 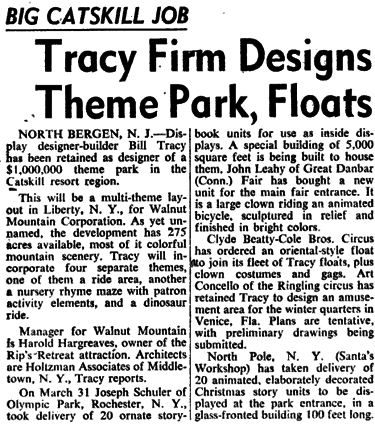 Bill Tracy signed a large contract in the spring of 1960 as he was retained as the designer of a $1,000,000 theme park in the Catskill resort region. This multi-theme park, located in Liberty, New York, incorporated four separate themes. During the spring of 1960, Bill Tracy also completed many various projects such as a set of 20 ornate storybook units for Olympic Park in Rochester, New York, which were used for inside displays. Great Danbar Fair in Connecticut purchased a new unit for the main entrance, a large clown riding an animated bicycle that was finished in bright colors. Beatty Circus ordered an oriental-style float adding to their already impressive collection of Bill Tracy floats, as well as a plethora of clown costumes and gags. Ringling Bros. hired Bill Tracy to design an amusement area for their winter quarters in Venice, Florida and Santa’s Workshop, located in North Pole, New York, took delivery of 20 animated and beautifully-decorated Christmas story units to be displayed at the park entrance. Article pertaining to Tracy’s various projects, as published in the April 11, 1960 issue of The Billboard. During the time that Bill was working for companies such as Macy’s and Ringling Bros., a transition took place that changed his focus and the amusement park industry forever. At some point along his professional journey, Bill Tracy’s inner “dark side” took over and he went from creating happy, appealing, conservative, and eye-catching window displays, parade floats, and circus props, to the most horrific, disturbing, provocative, and controversial dark ride displays the amusement park industry has ever seen. 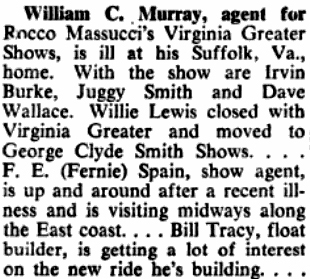 Article mentions the interest in Tracy’s new ride, as published in the June 27, 1960 issue of The Billboard.